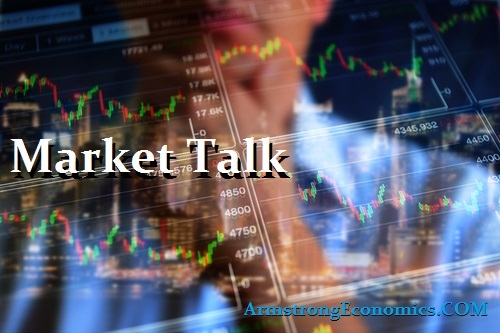 Having seen the US markets actions to the FED hike, we had a rather dull response in Asia which resulted in a mixed session. Tech and Real Estate pushed the Hang Seng down just over 1% through on-going data concerns, then also worries over increased funding costs. The Shanghai also fell -0.5% when the reverse repo rate was nudged a touch higher, which was disappointing after a positive start. SENSEX saw a similar pattern but did manage to stay positive for longer, but the afternoon session took us lower into the close. Energy, financials and tech hit this market also! We did see a small positive for the INR but GMW (Global Market Watch) is expecting these moves to be limited to this week. ASX finished just a fraction lower in cash trading, then later in the US session the A$ gave much of its gains back to trade back at 0.77 again. A weaker Yen was the reason provided for the 1% rally seen in the Nikkei. Talk of institutional buying, pension and retail investors all looking for stock. European stocks started lower and just kept going. It didn’t help that recent German data and todays PMI release was weaker than expected which is probably why the DAX fell the most (-1.7%). Obviously, the over-hang of a possible US-China trade war is not helping sentiment. The BOE voted 7:2 in favour of unchanged policy but that additional vote was enough to hit market further in afternoon trade. Though why the market believes rate rises are negative is still a questionable prognosis for a terminal market! FTSE ended the day down 1.25% with cable also returning all of its intraday gains and eating into the previous. Given the equity weakness we did see a rush into fixed-income with core benefiting whilst the periphery suffered as some doubt quality. US opened on a weak note and never looked back. The fears turned to reality this afternoon with a 724 point decline in the DOW (-3%), and the NASDAQ and S+P off around 2.5%. The Trump administration did place tariffs on trade designed towards China and the fear that this is causing was evidenced by todays decline. All of the steel stocks were off around double digits, but we still need to see how this plays out. Financials were also hit as treasuries benefited from the flight to quality. VIX moved higher as expected (+30%) closing at 23.32. Interesting that the volumes were so light, but is probably a reason we went so far. Japan 0.03%, US 2’s closed 2.29% (-1bp), 10’s 2.84% (-4bp), 30’s 3.07% (-4bp), Bunds 0.54% (-5bp), France 0.77% (-6bp), Italy 1.88% (-4bp), Greece 4.26% (+8bp), Turkey 12.09% (-6bp), Portugal 1.73% (-1bp), Spain 1.27% (-5bp) and Gilts 1.44% (-9bp).